Yandex.Disk keeps history of file changes from May 1, 2018. For example, if you accidentally delete important information from a file, you can go back to the previous version and restore the information. All previous versions don't take up space on your Disk. The history of changes is stored for 90 days from the last file changes. For example, if you edited a document on April 17, the document versions from January 17 to April 17 are saved in the history. However, if you don't have additional paid space on Disk, you have access only to the versions of the last 14 days. 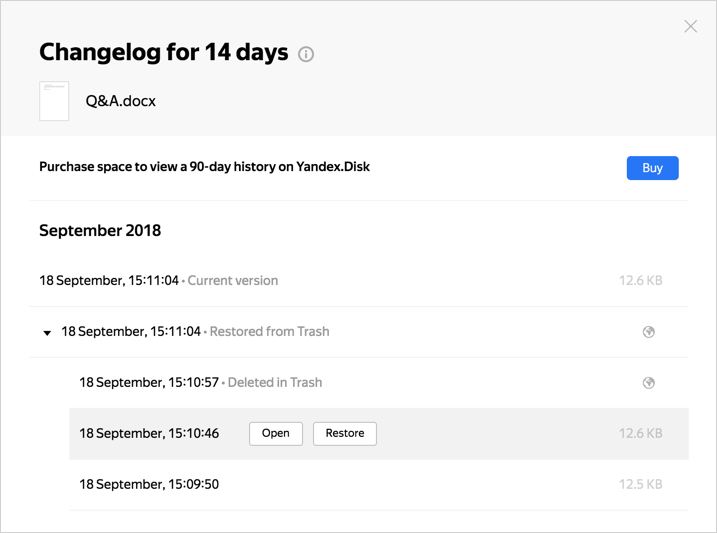 To get access to the full history connect to Yandex.Disk Pro. Click → History of changes on the upper panel or in the context menu. The history shows the dates and times when the file was created and modified. All actions with the file are grouped by days. You can't view the history of changes for other people's public files. If you save someone else's public file on your Disk, the history of changes starts from that moment. Shared folder history shows changes made by all folder members. The change history may be available only for documents or for all file types. It depends on whether the owner of the shared folder has paid Disk space.